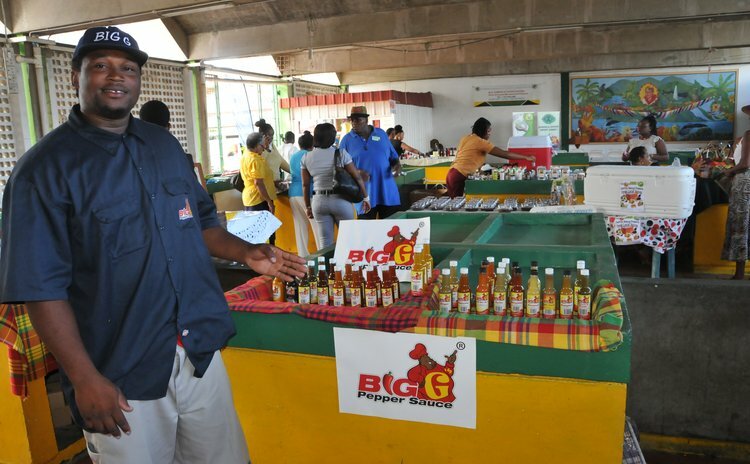 By converting his innovative ideas into effective action, Graceson John has proved to be one of Dominica's most creative entrepreneurs. In 2014, John, known as 'Big G' began manufacturing flavoured pepper sauces on a small scale and sold them from a relative's restaurant. Soon, the burly young man with the ready smile was supplying more and more restaurants. The following year, John expanded his production and began supplying supermarkets with 21 varieties of flavoured pepper sauces. Since then, almost all supermarkets on the island sell his products. Asked what gave him the idea to produce flavoured pepper sauces, John said the magic began while he was engaged in catering. "I love cooking so when I do catering I do different sauces," he said, noting that he experimented with sauces to complement specific dishes. One day, he got the idea to add pepper to his sauces and create unique spicy blends. John threw out the rule book and had fun coming up with a variety of blended hot sauces, including roasted garlic pepper sauce, turmeric sauce and roasted-pepper sauce. He also added passion fruit pepper sauce, coconut pepper sauce, cinnamon pepper sauce, mint and even coffee. Sometimes customers are bit skeptical about some of the flavours, yet most people who try his novel pepper sauces love their taste, he said. Elderly folks are usually more skeptical and prefer the traditional type of pepper sauce, he said. John is flexible and can customise the sauces to create flavours and strengths as requested by his customers. He buys peppers directly from farmers at Delices and others referred to him by DEXIA. The peppers John uses most are the West Indian Red, Cayenne and Yellow Scotch Bonnet. Production requires long hours of work, John said, but his efforts have been commended locally and regionally. In 2014, he won the Dominica Youth Business Trust's Innovative Business Plan Award. The following year, the National Youth Council bestowed him with the Entrepreneur of the Year Award. Also in 2015 Youth Business International (Barbados) recognised him as the Regional Entrepreneur of the Year. And last year he won the Dominica Manufacturers Association's Most Innovative Product and Best Quality Product awards. John intends to expand his product range to include flavoured ketchups, salad dressings, barbecue sauce, herbal rubs and seasoning sauces. He also plans to produce traditional-style pickled pepper chunks, especially for older folks. The inventive entrepreneur is also building a factory at Delices to facilitate an increase in production. At the moment, John produces just under 2,000 bottles of pepper mainly for the local market. However, he exports to St Croix and St Thomas as well. John said he has received critical support from a friend, Brendon Defoe in his venture. He advises other entrepreneurs to stay focused and not let the challenges sway them from their goals. "You have to expect failure. You have to expect hate, criticism and all that. . ." John said. A great business concept, a good plan and the ability to see it through to the end, might just be what it takes to match the success of John's Big-G products.